Fancy sandwiches! Fancy sandwiches for everyone! This is the rallying cry of San Francisco, and B. on the Go - the sister restaurant to B. Patisserie - is adding its voice to the chorus. We've got nothing bad to say about a city where high-quality meats meet professionally-made breads, smeared with artisanally-applied dollops of cheffy sauce. It's nice that the level of effort around something as simple as a sandwich is incredibly high. But then comes that nagging voice in the back of your head. Does it taste better? Did ego surpass execution? Would you be better off sampling the goods at the neighborhood deli? With respect to the last question, definitely not. Neighborhood deli sandwiches are garbage, and B. On the Go's are very much not. For example: the bahn mi. Oof, what a bahn mi. The ingredients appear to be typical — pork, sliced vegetables, and a roll. The flavor is not. The vegetables are oozing with pickling juices. The pork is popping with meaty flavor. The bread, while copious, is puffy and rippable. There are only two acceptable SF banh mis: a $3 version from Lee's Sandwiches, and this one. If you're gonna go high end, go here. The other sandwiches are solid, but don't quite reach the same level. The Cuban is dripping in melted cheese, so you know it won't be bad, but it ends up a bit one-note. The porchetta is drowning in bread (which, ahem, is a bit of an issue across the board). That said, the savories come with a bonus: fancy cookies! We had three. The chocolate chip won out. So, yes, we're glad SF has another classy sandwich shop. We think they should tone down the bread-to-filling ratio, which seems to be a pitfall for many bakeries that become sandwicheries. And we would love some more kick in our meats. 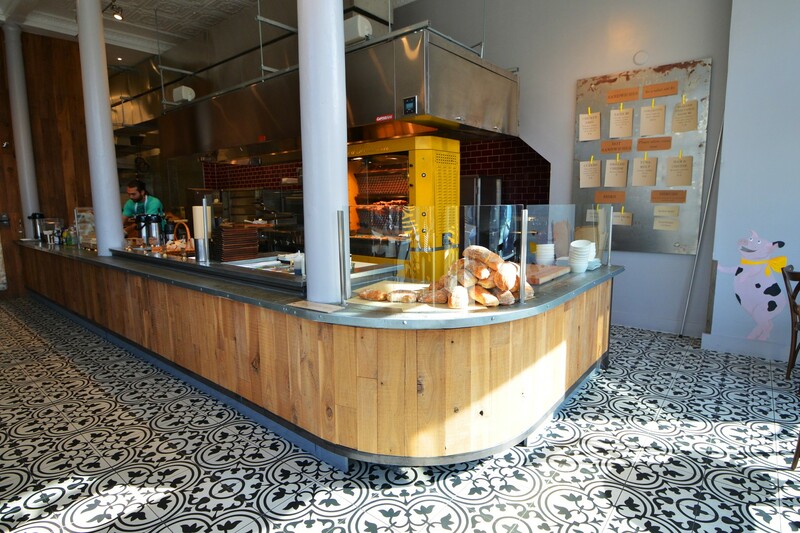 But picking up lunch from B. on the Go – if you happen to be unemployed and hanging out in Pac Heights – is a good call. We would kill for an excellent porchetta. This one was decent. The meat had fatty flavor, but the sandwich was 85% bread. We love bread, but this is unacceptable. Additionally, B. on the Go needs to work on making its bread a little more bite-able. We shouldn't need wolf-like fangs to tear our sandwich apart. Most of this review was about this sandwich, so you get the picture. Also maybe a little too much bread in this one as well? It was good, because any competently-executed Cuban is good. It was not great, let's say that. Once you see them, you'll have to get one. Go chocolate. The rest are not gooey enough.